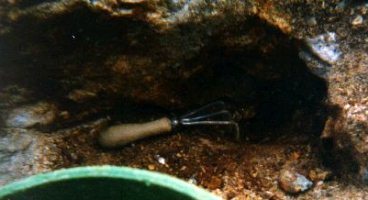 1998 was the first season that our intrepid group of would be miners had full control of the Orchard Pit. With the help of Gary Laverdere, not a permanent of our group, the equipment access to the western end of the pit was opened. 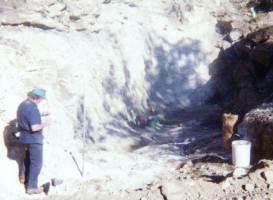 In this process we had expected to find the pegmatite continuing towards the woods at this end. However it seems the either gglaciers had removed this part of the pegmatite or the ledge had dropped sharply away. In any event we just encountered dirt to a depth of 10 feet or more. We next blasted away a hump at the western end of the pit. 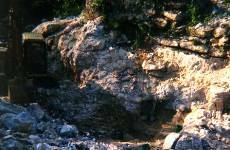 In this work we found little except for a few albites in small vugs. With this work complete we now were into the main body of the pit. The first series of benches in the western end of the pit produced little. There was a decided increase however in the occurrence of beryl in matrix as we progressed across the pit towards the eastern end. In July while drilling a bench, the drill fell into a pocket at a depth of about 5 feet. The pocket appeared to be about 1 foot deep. This was the first pocket larger than a vug that we had encountered. The wall of the pit was marked with orange paint to indicate the location of the pocket along the line of the pit. We had adopted this practice to help us re-orient ourselves as the blasting significantly changed the topography. This would often lead to confusion as to where the benches had been established. 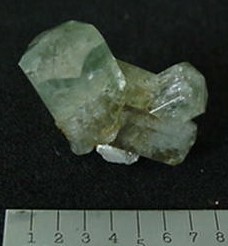 This bench produced a greater quantity of beryl in matrix than we had found thus far. Most was green but a few yellow pieces were found. All was opaque. Hoeing out the bottom, the pocket that the drill had fallen into was found. This pocket yielded some fine etched golden beryl. 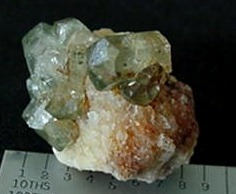 See the page on the ’98 golden beryl pocket. While cleaning out this pocket Doug Smith noticed an interesting oxidized zone along the northern wall of the pit. Scratching at the black maganese stained zone with a pair of tweezers, dubbed ‘pickers’, Doug extracted a beautifully doubly terminated ‘apatite’. This of course re-invigorated us to the hunt. Using small twigs we were able to scratch out hundreds of these ‘apatites’. We did not learn until the following May at the Maine Mineral Symposium that we had incorrectly identified our find. A geologist, Mark Jacobson, had brought us as a gift his book, ‘Antero Aquamarines’. Opening the book to page 109, the section on phenakites, he cautiously proffered that our ‘apatites’ were not apatites at all, but the much rarer beryllium silicate, phenakites. Later testing by him and others proved this identification to be correct. Egg on face as the saying goes. (I highly recommend Mark’s book. It proved to be both enjoyable and educational. The book is available from L.R. Ream Publishing). These were the only phenakites we found in 1998 and the only ones of size since then. In fact these may be some of the largest phenakites found in Maine. Prior to this they had been reported from Lord Hill and Topsham but only in mm sizes. There may be one notable exception however. A well known Maine miner, Charlie Bragg, brought home one evening a large peach colored crystal. Although he had been working at the Orchard Pit around that time, he did not, unfortunately, tell anyone where he had found it. After Charlie’s death the crystal passed into the possession of Ron Larivee, Charlie’s partner. 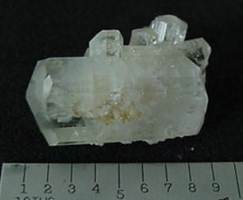 This crystal proved to be one of the largest phenakites ever found. Above Mike Robbins, a powder man from Ryan Rock, is loading the hole prior to blasting. 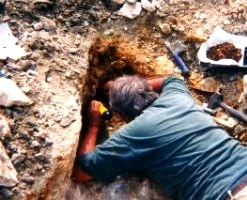 The phenkite pocket is located approximately under the brown amfo bag at the right of the picture. The next two jpegs are of the pocket and the removal of the phenakites. If we had it to do over we would probably have been a little more careful and taken greater care to extract more on matrix. The black manganese oxides coating most of the material made it difficult to see. Not until it was washed in a screen did the true nature of the find reveal itself.